Bali is known as a tropical paradise, but there is more to Bali than beaches, surf and cocktails. Go beyond the Kuta, Legian and Seminyak tourist strip and you’ll find some very strange things going on. Like abandoned planes beside the highway. Or haunted hotels and underwater temples We’ll also show you where to find a fabulous villa nearby! 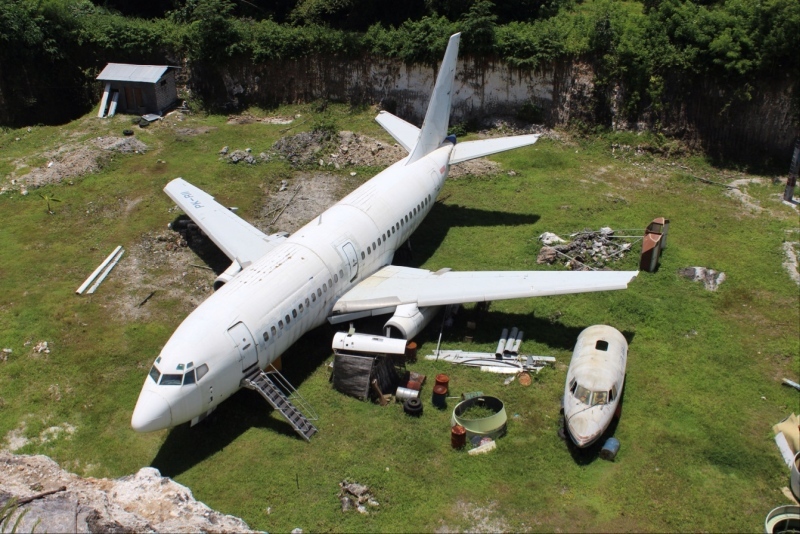 One of the stranger tourist attractions on Bali’s Bukit Peninsula is an abandoned plane lying in a field just off one of a major highway. Stranger still is the fact that this is not Bali’s only abandoned plane! A short distance north (next to Dunkin’ Donuts) a second abandoned plane can be found. Where did they come from? Why are they here? To whom do they belong? No one seems to be entirely sure. It is rumored that both planes were originally supposed to be developed into restaurants. Whatever the truth of this, they are now great places for a photo opportunity and a spot of bizarre urban exploration in Bali. 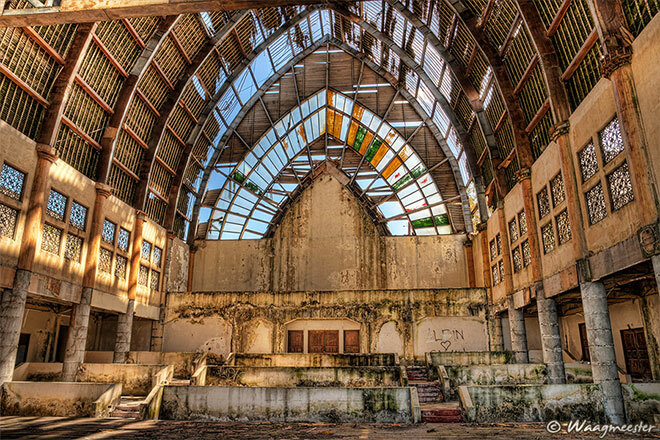 Staying with the abandonment theme, Taman Festival was a short-lived theme park that opened near Sanur Beach in the late 1990’s. In 2000, the place closed its doors for the last time and nature has slowly reclaimed the site. According to local folklore abandoned sites attract not only wildlife, but also the spirits of the dead. In the case of Taman Festival it’s potentially not only otherworldly souls that you may have to fend off, but according to some, the park’s resident crocodiles were never removed when it closed and have since become cannibal crocs! Fact or fiction? You be the judge. Either way, this is a great place for a bit of urban Bali exploration and its decaying structures make for some fantastic photos. Just pay attention when close to any water – you never know what may be lurking below the surface! 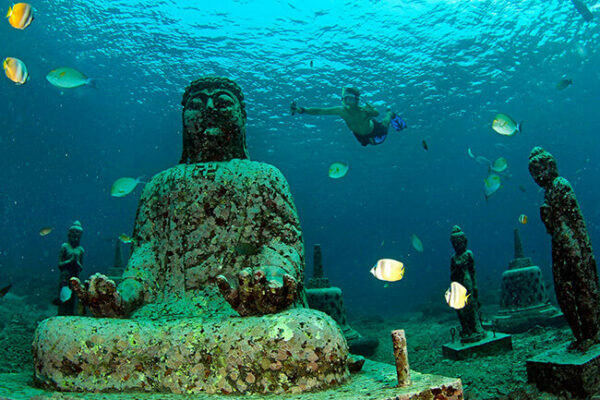 Located close to the shore at Pemuteran Beach is one of Bali’s most unusual and beautiful dive sites – an underwater Hindu temple and surrounding gardens. Though this may look like an ancient archaeological site, the temple was constructed in 2005 as part of the Pemuteran Karang Lestari Coral Conservation Project, which is dedicated to saving local coral reefs. The main part of the site lies at a depth of 30m and consists of a 4m high temple gateway and several massive statues, whilst a later addition of several further statues can be found at a depth of 15m. 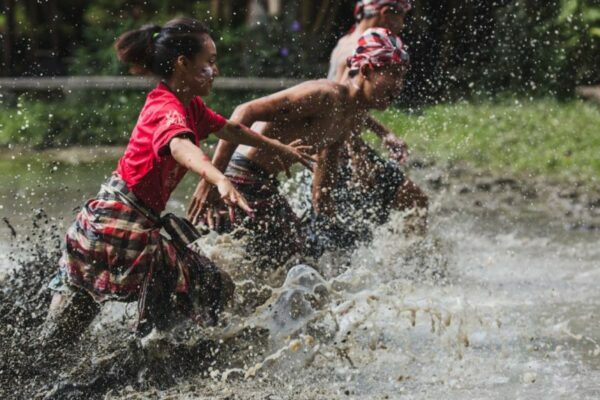 A traditional dance in Bali may not seem so unusual but this one is a little different. The usual gamelan music is replaced with the ‘cak, cak, cak’ chant of a male chorus accompanied by a fiery spectacle that lights up the stage. The dance tells the story of the ancient Hindu epic the ‘Ramayana’ about a princess who is kidnapped by a demon. After many twists and turns in the tale, a monkey king sets fire to a castle. Combine the dance with the dramatic clifftop setting of Uluwatu, and you end up with some lifelong memories and an amazing photo opportunity. The performance, which begins just before sunset, takes place in a small amphitheatre, just to south of Uluwatu’s famous temple making it possible to tick two not-to-be-missed cultural adventures off the list in one day. The P.I. 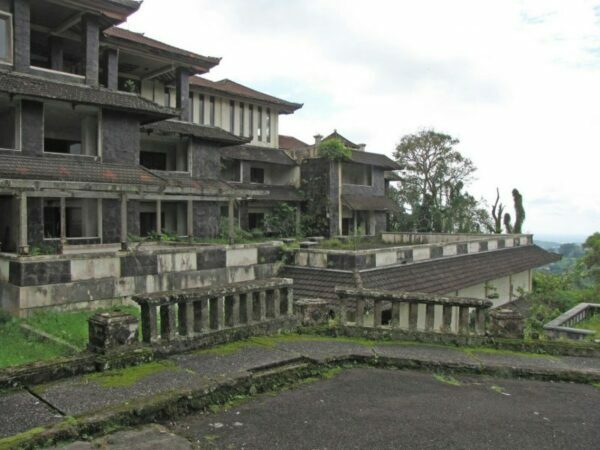 Taman Rekreasi Hotel & Resort, sometimes called the ‘Ghost Palace’, is a huge abandoned resort hotel in the mountains close to Bedugal. Development started in the late 1990’s but just prior to opening the project failed (some say that the developer was cursed!) and the site has been deserted ever since. Well, deserted by the living anyway. Some believe the souls of deceased construction workers now wander the corridors, whilst others believe that the hotel did open, albeit briefly, and that its ghostly apparitions can be attributed to a group of guests and workers that disappeared during the night. Whatever the truth behind the history of this spooky place, its a great location for those who want to test their mettle against the supernatural. And if the ghosts are being particularly elusive, there are terrific views of the surrounding landscape for consolation. The water temple of Tirta Empul has been an important religious site for the Balinese for more than 1000 years. The temple is built on top of a natural spring that feeds many pools and fountains and provides the holy water used for the purification ritual that takes place. It’s worth noting that this is a place of serious religious worship for Hindus. Respectful foreigners are invited to partake in the ancient rite. If you wish to participate, be prepared to get wet. It’s worth hiring a guide to explain important elements of the ritual. Mepantigan is a form of Balinese mud wrestling and the absolute best way to experience this unique Bali adventure it is go to the full moon ceremony at the The Green School near Ubud. Highly trained practitioners put on a performance that incorporates elements of Balinese folklore, Indonesian shadow puppetry, capoeira, fire eating and, of course, mepantigan. For those who prefer to get their hands dirty (literally), there are now a few places around the island that offer training, for both adults and children in this unique martial art. 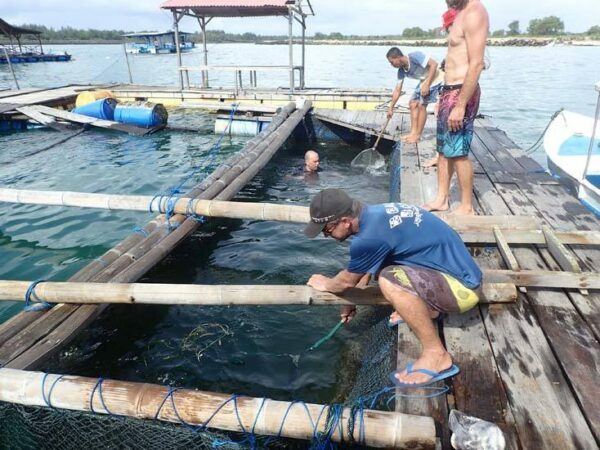 Bali Sharks is a conservation nursery that rescues young sharks, intended for the seafood market. The centre nurses sharks back to health before releasing them into the wild. A tour of the centre, includes the chance to swim with the animals and feed them (preferably not at the same time!) as well as a trip to the nearby Turtle Conservation & Education Center. All proceeds go back into the conservation effort.